A BBC Radio Manchester reporter found himself at the frontline of a major news story – at the hospital where he is receiving cancer treatment. Jonathan Ali was visiting a support centre at the Christie Hospital in Manchester on Wednesday morning when a fire broke out. 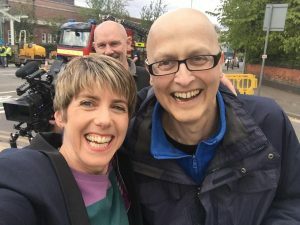 Ali, a senior broadcast journalist at Radio Manchester, has been off work for more than a year while undergoing chemotherapy. But on Wednesday he quickly slipped back into reporting mode and gave live updates on the fire for the BBC’s news outlets. He appeared on BBC Radio Manchester, BBC Radio 5 live and the BBC News Channel. Ali, 48, was the first reporter on the scene as the fire broke out. He had been recuperating at the Maggie’s Centre at the Christie Hospital after receiving his final course of chemotherapy. He noticed black smoke coming from another part of the hospital building. He said: “I was having a cup of tea and a piece of cake, which is what you do at the Maggie’s Centre, when I saw thick, black smoke. So I got up and went to see what was happening. It was pretty clear there was a huge fire at the hospital. Ali, from Bury, has cancer of the soft tissue. His treatment this week is his last and he's due back at work in May. Kate Squire, editor of Radio Manchester, said: “We’ve all missed Jonathan and are looking forward to having him back on the station very soon. His appearance on Wednesday was a little sooner than we were expecting. “It just goes to show, the journalistic instinct kicks whenever and wherever you are. And Jonathan is one of the best journalists around.